First impressions of the Corsair HS50 are incredibly good. Unpackaging it and getting it out of the box is a joy, and if you didn't know the price, it could easily pass for something three times its price. As the HS50 uses a native 4pole jack, to use with a PC you will need to use the included audio/microphone splitter, or you can plug it directly into any mobile device or game console controller. 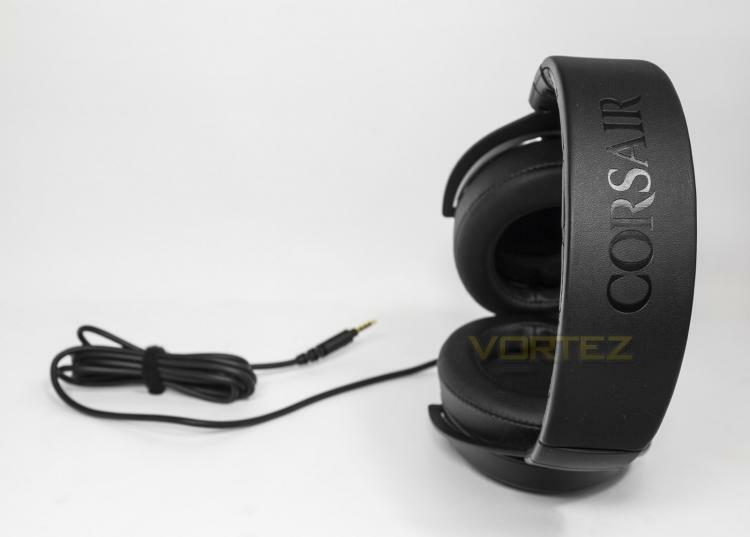 Corsair have certainly done something special regarding the construction of this headset, however, some concerns are sparked, for example, without foresight it is difficult to know how well the leatherette material will wear over time. Though the sleek shape and design is pretty much perfect. On the head, I felt that the clamp force is moderate, some may prefer it to be a little lighter. Also, it was only once we put the headset one, that we noticed that the earpads didn't quite give the plush cushioning that they promise, instead you can feel the foam is actually a rather narrow strip that you can distinctively feel encircling your ear. Far from uncomfortable, but not quite plush. Regardless, over a couple of hours there was no real issue with comfort. At this point it is worth noticing that we couldn't find a quick/safe way to remove the earpads. The onboard controls are something we love to see and the solution Corsair have used are solid and functional. The volume dial gives a firm but smooth rotation while the mute button is bouncy and clicky, allowing it to be quickly pressed/depressed. The cable itself is a rubberised anti-tangle type that is hardlined to the headset, though it would be nice to see fully modular, braided cables, that could be too much to ask for considering the construction quality and price point. One final note we would like to mention would be the weight of the HS50. Coming in a little under average at 319g, we can't help but feel that it could be lighter considering the use of additional material purely for aesthetic value such as the metal grills on the sides. To get a gauge of audio performance, we listen through various audio tracks in either FLAC or MP3 320Kbps and note the differences. The Corsair HS50 has a very deep and warm tone, but is slightly misleading as it doesn't exactly pronounce the bass as accurate as it could. The mids are adequately presented while the treble is fairly dull. General listening is enjoyable and certain tones present themselves very well at times, somewhat like a stew of sound where sometimes the texture is different, but each bite tastes the same. Gaming performance benefited far more from the warm tonal signature than it does to music playback. The deep sounds create a soundscape that travels, and engulfs you. It certainly makes playing Resident Evil 7 a scarier ordeal, and it does well to create a somewhat open sound, but does lose a little crispness in the details of the sound. The flexible, detachable microphone is discrete and easy to move to your desired position. Actual pick up quality is good, with the voice sounding smooth and natural with some added warmth. It also does a good job of reducing the sound of the background noises. Overall we are impressed with the microphone quality, especially at this price point.